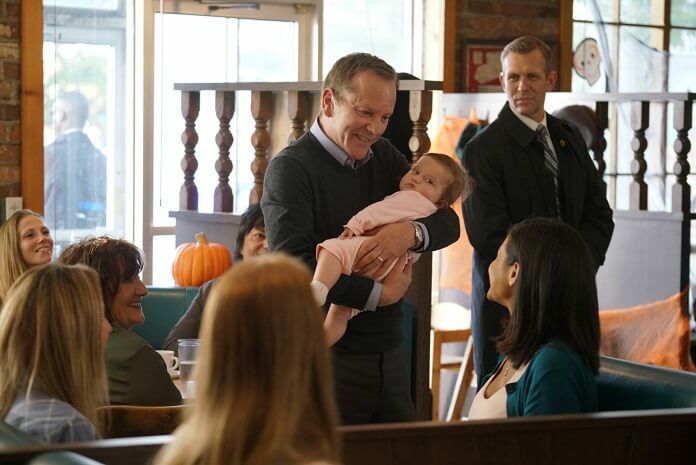 “They’re calling it Suckergate, sir,” says Lyor Boone (Paulo Costanzo) to President Tom Kirkman (Kiefer Sutherland) after something he said to a senator was taken out of context in season two episode five of ABC’s political drama, Designated Survivor. The episode begins with a woman running in the park when she’s shot and killed. The very next scene is a government-sanctioned hockey game with President Kirkman participating. After the game, Kirkman’s reaching out to a senator friend of his in the locker room trying to get him to push his Republican friends to vote yes on the pension bail-out bill. In trying to get the reluctant senator to agree, Kirkman jokingly calls the American people suckers, a moment he’s going to wish he could take back. The President gets word about the shooting in the park and it turns out the victim was Charlotte Thorne, a member of parliament. Kirkman has FBI Agent Hannah Wells (Maggie Q) assigned to the case, with Aaron Shore (Adan Canto) overseeing. Wells is teamed up once again with Damian Rennett (Ben Lawson) for the investigation, and they get a lead that a legitimate arms manufacture/seller has been having a war of words with threats of lawsuits with the victim, Thorne, who was anti-guns. Wells and Rennett question Darius Cray but he knows his rights. After admitting to threatening Thorne with lawsuits, he warns them if they approach him again he’ll have them up on harassment charges. This doesn’t scare them off; in fact, they become even more determined to follow and observe Cray. Meanwhile at the White House, it gets back to the President that his “suckers” comment was quoted by the senator when he was on television to make it seem like the President believes the American people are easily fooled. This begins to take on a life of its own, with every news program talking about it. Poor Seth (Kal Penn) tries his best to defuse the situation with the press but to no avail. Kirkman doesn’t believe it to be that big of a deal until he’s told by Emily (Italia Ricci) and Lyor that if he doesn’t come out fighting and denying that he said it, this could derail his presidency. Kirkman tells them he can’t because even though what he said was taken out of context, he did say it and won’t lie his way out of this problem. Lyor’s upset as he leaves the Oval Office, telling Emily, “If I had known he was this truthful of a president, I never would have taken the job.” Emily points out that’s why Kirkman has a staff willing to walk through fire for him. Tom makes time during this incident to talk to his wife, Alex (Natascha McElhone), and encourages her to hire White House counsel Kendra to represent her mother and to fight the subpoena. At first hesitant, Alex talks to Kendra (Zoe McLellan) and decides to hire her. Kirkman meets with the senator who revealed the private conversation to the press and asks him to clarify what they were talking about. However, the senator stands his ground and tells Kirkman he won’t back him and that he does think the President at times views the American people as suckers. Kirkman and his staff are shocked by the senator’s words. Later, Kirkman is talking to his security man, Ritter (LaMonica Garrett), who tells the President that what he admires most about him is how he brings hope to the people’s lives and that he should continue to spread hope even when others are throwing mud. Out by a boat Cray owns, Wells and Rennett decide to do some snooping on board. (Don’t they need a warrant to board and search a boat?) This is when Cray comes up behind Wells, obviously looking to do her some harm, and gets shot by Rennett. Back at the White House, Kirkman tells his staff he wants to do a man-of-the-people publicity outing. A few hours later, Kirkman’s in a diner shaking hands, holding babies, and laughing with the patrons while the cameras roll and cover it. Things are going extremely well until he’s met by the advocate for those who lost their life savings in the pension fraud. The advocate points out that if he isn’t willing to give her his word and promise to pass the pension bail-out bill, then maybe the American people are suckers for believing in him. Back to square one for President Kirkman. As Kendra heads in to try to get the subpoena thrown out, she’s met by Alex who wants to be her co-counsel. Kendra tries to talk her out of it but Alex insists. During the hearing, Alex keeps interrupting Kendra and lets her temper flare about her mother getting a subpoena. Kendra calls for a 10-minute recess which she gets. She uses it to tell Alex that if she’s going to do her job, Alex can’t be co-counsel. Alex finally agrees and Kendra heads back into court. She reveals the documents that led to getting the subpoena were obtained illegally. The Judge agrees with Kendra and squashes the subpoena. Wells is relaxing in her apartment when Rennett stops by to say goodbye. Seems like Cray was doing some under the radar gun dealing and is the likely suspect for killing Thorne. Wells and Rennett flirt a little and finally Rennett kisses Wells. Just as the two are getting to know each other better, Wells’ phone rings and it’s Aaron who tells her he needs to see her because there has been a development in the Thorne case. Believing he does need to stop Suckergate from getting any worse, Kirkman reluctantly agrees to talk to television host Carson Kramer (think a male Barbara Walters) to expose the ugly secrets of the senator who created this problem. But just as he’s about to do it, he flashes on what Ritter said to him about hope and goes a different route. Kirkman admits to calling the American people suckers because they believe in the American dream and so does he, which makes him a sucker too. Kirkman then uses the rest of the interview to push the country’s urgent need for the pension bail-out bill. Aaron tells Wells and Rennett that solid proof came in showing Cray couldn’t be the one who killed Thorne and that they’re still on the case. As Kirkman is getting ready to call it a night, he gets a visit from the senator who caused Suckergate. Kirkman says he doesn’t have much time for him and the senator apologizes and tells him he will back his bill. The senator asks if he can explain and confesses to Kirkman that his wife has been battling cancer and he was unfaithful to her during part of that time. The senator goes on to say that he and his wife are trying to work things out and he thought he could pull one over on the president for one last win. He admits it was stupid thinking. Kirkman does his best to console the senator and shows him the file he had on him that revealed his indiscretions. Kirkman tells the senator the information is already out there if his people could find it and that he has to get out in front of it before it’s too late. With Kirkman facing a silly crisis called Suckergate and a new political murder for Wells to investigate, the move to make the show a political drama/soap opera instead of a political thriller continues. One of the improvements this time is the murder of a member of parliament which could have much more to it than just being about gun control. This will give the show a little of the cloak and dagger aspect that was so strong in the first season and gave the show its suspense. With Kirkman and his staff facing a major threat on the high seas in next week’s episode, here’s hoping the series starts to move back to the high stakes politics and lives hanging in the balance risks it dealt with so well in the first season.